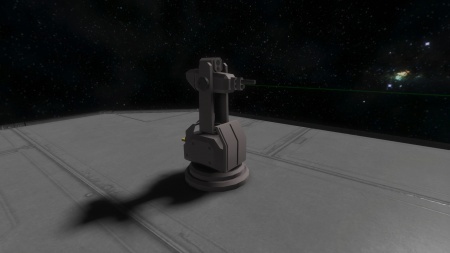 Functional as of version 01.027.006, the interior turret is an automatic weapon which will target and fire upon the nearest hostile block, Decoy, moving object, meteor, or any other specified target within its operational range (adjustable via its control panel), and will always fire on enemy factions' ships and players in range. In Survival Mode it must be loaded with 5.56x45mm NATO Magazines to fire, or if while in Creative Mode it has unlimited ammunition. The turret take the space of a single cube despite its appearance. The turret has its own internal inventory which needs to be stocked manually with 5.56x45mm NATO Magazines to function, unlike the Gatling Gun it cannot use the Conveyor Network as there are no Conveyor connections. The interior turret does very minimal, but consistent damage. It is far less powerful than the Gatling Turret, but is relatively cheap and compact using only relatively low-cost ammunition and being able to be fitted into tight corridors. This is very much intended for an anti-personnel role, on the interior of ships and stations to defend key choke points and act as sentries. Players are able to take control of any automated turret by sitting at either a Control Station, Flight Seat, Cockpit or Fighter Cockpit. After the player can navigate in the control panel to locate the turret, and click on Manual. This will bring up the 1st-person view of the turret. The player can move, and shoot with the turret while in this mode - unlike the Camera the turret does not seem to support zoom functions. Any object that moves at a speed above 2.5 meters per second. All blocks, entities, and players. 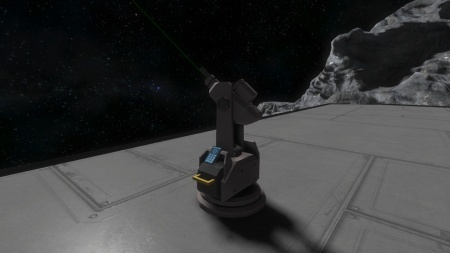 Interior turrets are better suited for defense against other Space Engineers, and other entities. They aren't as effective at destroying blocks like the larger Gatling Turret. These turrets can be used to fight off meteors at a cheap cost, but they will have a difficult time destroying the larger meteors. Unintentionally turrets may fire at your ship if a target passes behind blocks fast enough, however it was disengage after the target does so. This page was last modified on 20 September 2017, at 20:09.